Well, it took me a while, but I finally saw it. How could I call myself a film critic without ever seeing one of the biggest and best movies of the year? Maybe I thought it would be stupid. Or perhaps more likely, I was afraid. You'll notice that I don't review scary/horror flicks. That is for a reason. Enough said. However, one of the greatest lessons that I have learned in life is that you have to face your fears head-on, toe-to-toe, and defeat them, or they will wind up controlling and destroying you. This same lesson is taught in The Sixth Sense, and it applies to almost every character in the film. First and foremost, there is Cole Sear (played superbly by the young prodigy actor Haley Joel Osment...who should have won an Academy Award for Best Supporting Actor, for which he was nominated, or even Best Actor, for that matter...you may also remember him as Forrest Gump, Jr). It's no secret that Cole eventually confesses his big secret to Malcolm, a child psychologist, by whispering, "I see dead people." Cole's curse haunts him continuously, and, like those unlucky few before him with the same ability to see ghosts, it prevents him from living a normal life. He desperately needs the help of his psychologist, Malcolm (Bruce Willis), who is wrestling with his own problems. Eventually, Malcolm teaches Cole to protect himself and to rid himself of his fears, not by hiding from them (as he does below, in his tent), but by facing them and communicating with them. This movie is wonderfully crafted. Written and directed by newcomer M. Night Shyamalan, the plot unfolds beautifully, and it remains true to the rules and boundaries which it defines. I viewed this movie on DVD (which is awesome, by the way), and I was thrilled to see that the DVD came with a ton of Bonus Material. We get to see commentaries by Mr. Shyamalan and others who worked on the film, and we see their interpretations and intentions and how they brought this movie to fruition. Particularly interesting were the deleted scenes, which I felt should have been left in. I especially loved Night Shyamalan's personal favorite scene, which was a video clip of Bruce Willis' character, Malcolm, making a speech at his wedding. Sadly, this clip was deleted from the movie at the last minute, which was a real crime. Another interesting piece from the Bonus Materials is the section entitled "Rules and Clues," which discusses how the filmmakers went about defining a set of rules for the film and how they struggled to maintain them. They also mention their use of color; specifically, the color red was used throughout the entire film to indicate anything in the real world which had become tainted by the "other" world. I had heard many recommendations to see this film by almost everyone I know. All of them mentioned the ending, which they claimed had a great plot twist. Unfortunately for me, I figured out what that twist was very early in the movie. Perhaps it was because I was really searching hard for it. At first I felt that it was too obvious, but I have since realized that almost no one else knew what was happening before the revelation at the end. Thus, I will stifle this criticism and simply proclaim, "Oh yeah...I'm bad." But seriously, this film's greatest achievement (and source of popularity, I'm sure) is that it can, and should, be watched twice (at least). I've seen it twice already myself. The movie holds up beautifully under all scrutiny. 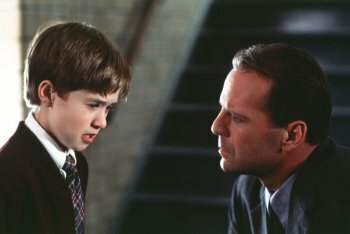 As for the suspenseful, and the downright "scary", aspect of The Sixth Sense, it definitely had me jumpy and on-edge (although, perhaps that is not saying much). The music, the lighting, and the buildup of tension were perfect. 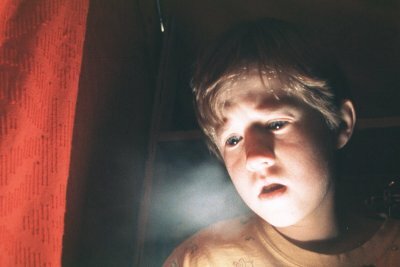 However, what really made this movie believable and gripping was Haley Joel Osment. This little boy was the conduit though which the energy of the movie passed from the screen to the audience (nice metaphor, don't ya think?). Personally, I loved how this movie addressed many of the issues and phenomena of the unknown. However, I felt as if there was much left unsaid on these topics which would have been a lot of fun to ponder. I also felt as if the flow of the movie was somehow interrupted at times; perhaps this could be due to the fact that scenes were removed after filming. In addition, there were a couple of scenes which were never really explained later on. All in all though, I tip my hat to Night Shyamalan, Bruce Willis, Haley Joel Osment, and everyone else who went into making this supernatural thriller. If you haven't seen it, you are really missing out on what will surely wind up being a classic. 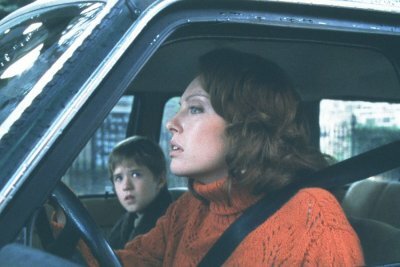 How would you rate the movie The Sixth Sense? There have been 25644 people to visit this page since Sat, Apr 8, 2000. And you are the first person to visit this page today!